Eject honestly believes that the Autobots and the Decepticons could just agree to resolve their disputes through some friendly competition, then the entire war could be brought to an end. Ramhorn disagrees. He'd rather spike a Decepticon on his horn than spike a ball in the end zone. 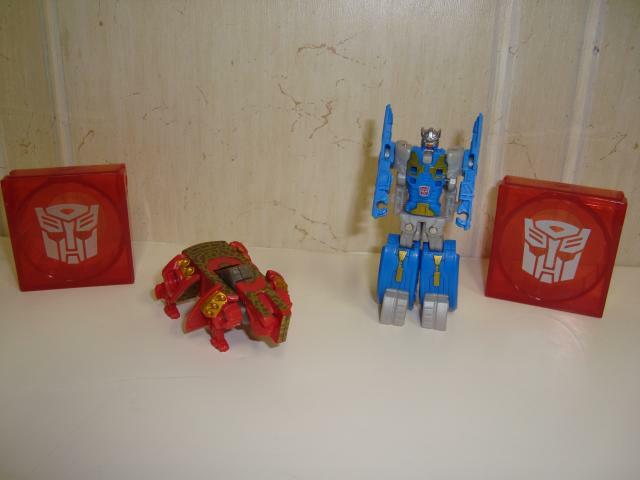 To round out the Autobot data disc two packs in the Generations line, Eject and Ramhorn make an appearance. They stand amongst Rewind, Sunder, and Steeljaw to make a complete set to go with the Voyager Class Generations Blaster, and can all fit inside Blaster�s chest for storage or ejection. The data discs have a fun gimmick of auto-transformation, and a surprising amount of detail for such small figures. And they also come with disc storage cubes done in clear, red plastic. The bunch is better as a set, but these guys can also be purchased as two-packs � but would you want to? Getting Eject into Robot mode is literally a snap. Push a small button on the underside of the disc and let go. Eject springs into a flying belly flop position! It�s slightly disappointing that he doesn�t fully auto-transform � you still have to rotate his arms down and push his feet out to stand. A minor complaint for such a fun little figure. Once in robot mode, you get to view all of the great detailing that went into Eject/Rewind. There�s a lot of molded detail difference between these two and their Decepticon counterparts. The arms, legs, torso and head are all different in molded detail, yet are the same in size and composition. Eject, like Rewind, has a lot of painted detail as well: a small red & white Autobot symbol on the torso, silver/grey thighs, feet, shoulders, and head, as well as a painted visor and faceplate. There�s also some gold highlighting on the legs and chest. Overall, the detailing is so well done it nicely breaks up all the light blue coloration. Articulation is minimal � his shoulders swivel and that�s about it. Overall though, Eject is a nice little figure. Like all the other discs, Ramhorn�s alternate mode is a data disc. 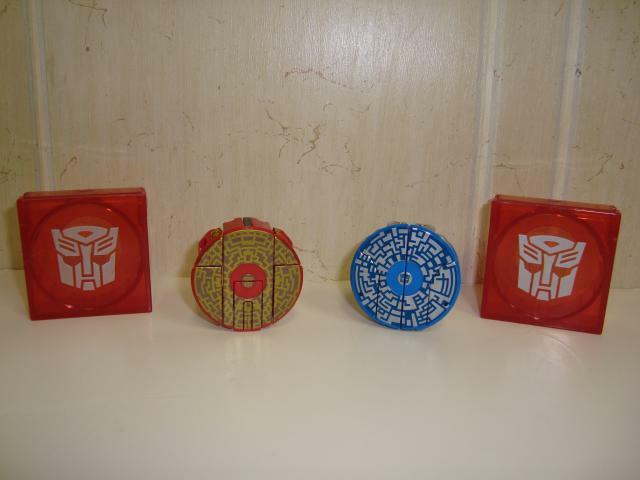 Molded in dark red plastic, the top of the disc is digitally detailed in black and gold with a gold Autobot symbol in the middle. And that sums up the alternate mode! A press of a button and Ramhorn shoots into rhino mode. This auto-transformation works really well. In contrast to some of the other discs who need some fiddling to get them into their alt modes, Ramhorn shoots right to where he needs to be. Mine seems to spring there with a lot of force. Maybe it�s a tight spring, or maybe it�s just that the parts don�t travel far to get to their destination. Either way, it works smoothly and is a synch to snap back together. Ramhorn�s rhino mode is appropriately stocky and short like a rhino. He�s got some good detailing too, with various robotic molded details on the legs and head. Paints apps are somewhat scarce with some gold on the shoulders and eyes, but the detailing from the disc ends up mostly on his back, so that does a good job of breaking up the red plastic. Ramhorn is sturdy in this mode and stands really well on his squat legs. He�s a well done rhino for sure. Transformation Design: 5. The auto-transformation gimmick works smoothly on both. Durability: 7. The spring mechanism is most likely to wear over time. Fun: 7. Switching between modes is fast and easy. Other than that, they just stand there. Aesthetics: 8. Paint apps and detailing are well done. Articulation: 3. Not much to say here. Ramhorn literally has no articulation. Value/Price: 6. Two figures for ~$10 USD. A decent price for a decent set. Overall: 7. Eject is just like the other discs of his type, just with a brighter color palette. Ramhorn is a really cool little rhino and worth consideration for your collection. Buy these guys as a set with Blaster and you�ve got something fun. On their own they�re just OK.